Human migration denotes any movement by human beings from one locality to another, often over long distances or in large groups. Humans are known to have migrated extensively throughout prehistory and human history. The movement of populations in modern times has continued under the form of both voluntary migration within one's region, country, or beyond, and involuntary migration (which includes trafficking in human beings and ethnic cleansing). The people who migrate are called migrants, or, more specifically, emigrants, immigrants, or settlers, depending on historical setting, circumstance, and perspective. Human migrations, initiated for whatever reason, have affected the grand epochs in history, changing forever the demographic landscape of lands throughout the world, bringing, on some occasions, innovation and mutual benefits, and on others destruction and suffering. While social scientists and historians look for external causes for these happenings, including climate change and political or religious oppression, religious scholars and people of faith regard many such events as the playing out of God's providence, bringing humankind ever closer to a time when human beings fill the earth and live as one family in peace and harmony. There are two main types of migrations: Domestic and international. In domestic migration people move within their homeland, be it from one town to the next or across the country. This may take the form of moving from one level of density to another such as rural to urban (or vice versa). International migration involves crossing international borders. International migration can occur over relatively short distances such as that in between the member states of the European Union or can involve moves to entirely different continents such as from Asia to Africa. Migration is generally considered a permanent action, although some people migrate to other places for rather long periods of time (months or years) rather than permanently. 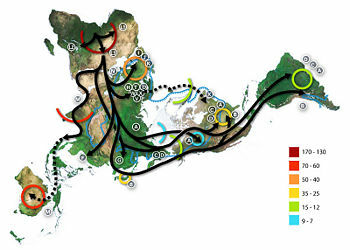 Map of early human migrations according to mitochondrial population genetics (numbers are millennia before present). Human migration has taken place at all times and in the greatest variety of circumstances. They have involved tribal, national, class, and individual levels. Causes have been climatic, political, economic, religious, or simply for love of adventure. Its causes and results are fundamental for the study of ethnology, of political and social history, and of political economy. The pressures of human migrations, whether as outright conquest or by slow cultural infiltration and resettlement, have affected the grand epochs in history, such as the fall of the Western Roman Empire; under the form of colonization, migration has transformed the world, as for example in the settlements of Australia and the Americas. Historical migration of human populations began with the movement of Homo erectus out of Africa across Eurasia about a million years ago. Homo sapiens appears to have colonized all of Africa about 150 millennia ago, moved out of Africa some 80 millennia ago, and spread across Eurasia and to Australia before 40 millennia ago. Migration to the Americas took place about 20 to 15 millennia ago, and by two millennia ago, most of the Pacific Islands were colonized. Later population movements notably include the Neolithic revolution, Indo-European expansion, and the Early Medieval Great Migrations including Turkic expansion. The Age of Exploration and European Colonialism led to an accelerated pace of migration since Early Modern times. 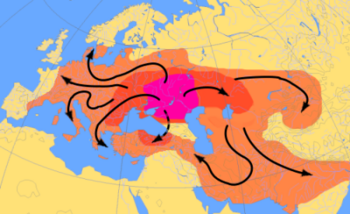 Scheme of Indo-European migrations from c. 4000 to 1000 B.C.E. according to the Kurgan hypothesis. The purple area corresponds to the assumed Urheimat (Samara culture, Sredny Stog culture). The red area corresponds to the area which may have been settled by Indo-European-speaking peoples up to ca. 2500 B.C.E. ; the orange area to 1000 B.C.E. The Indo-European migration had variously been dated to the end of the Neolithic (Marija Gimbutas: Corded ware, Yamna, Kurgan), the early Neolithic (Colin Renfrew, 1987: Starčevo-Körös, Linearbandkeramic) and the late Palaeolithic (Marcel Otte 1996, Paleolithic Continuity Theory). The speakers of the Proto-Indo-European language are usually believed to have originated to the North of the Black Sea (today Eastern Ukraine and Southern Russia), and from there they gradually migrated into, and spread their language to, Anatolia, Europe, and Central Asia Iran and South Asia starting from around the end of the Neolithic period. Other theories, such as that of Colin Renfrew, posit their development much earlier, in Anatolia, and claim that Indo-European languages and culture spread as a result of the agricultural revolution in the early Neolithic. Relatively little is known about the inhabitants of pre-Indo-European "Old Europe." They are believed to have been hunter-gatherers. The Basque language remains from that era, as do the indigenous languages of the Caucasus. The Sami are genetically distinct among the peoples of Europe, but the Sami languages, as part of the Finno-Ugric languages, spread into Europe about the same time as the Indo-European languages. However, since that period speakers of other Finno-Ugric languages such as the Finns and the Estonians have had more contact with other Europeans, thus today sharing more genes with them than the Sami. The earliest migrations we can reconstruct from historical sources are those of the second millennium B.C.E. It is speculated that the Proto-Indo-Iranians began their expansion from ca. 2000 B.C.E., the Indo-Aryan migration hypothesis suggests that they reached Assyria in the west and the Punjab in the east by ca. 1500 B.C.E. In the Late Bronze Age, the Aegean and Anatolia were overrun by moving populations, summarized as the "Sea Peoples," leading to the collapse of the Hittite Empire and ushering in the Iron Age. The Bantu first originated around the Benue-Cross rivers area in southeastern Nigeria and spread over Africa to the Zambia area. 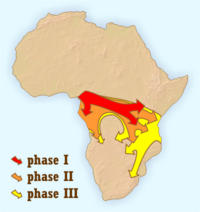 Sometime in the second millennium B.C.E., perhaps triggered by the drying of the Sahara and pressure from the migration of people from the Sahara into the region, they were forced to expand into the rainforests of central Africa (phase I). In the first millennium B.C.E., they began a more rapid second phase of expansion beyond the forests into southern and eastern Africa, and again in the first millennium C.E. as new agricultural techniques and plants were developed in Zambia. By about 1000 C.E. it had reached modern day Zimbabwe and South Africa. The Dorian invasion of Greece led to the Greek Dark Ages. Very little is known about the period of the twelfth to ninth centuries B.C.E., but there were significant population movements throughout Anatolia and the Iranian plateau. Iranian peoples invaded the territory of modern Iran in this period, taking over the Elamite Empire. The Urartians were displaced by Armenians, and the Cimmerians and the Mushki migrated from the Caucasus into Anatolia. A Thraco-Cimmerian connection links these movements to the Proto-Celtic world of central Europe, leading to the introduction of Iron to Europe and the Celtic expansion to western Europe and the British Isles around 500 B.C.E. Second to fifth century migrations. Western historians refer to the period of migrations that separated Antiquity from the Middle Ages in Europe as the Great Migrations or as the Migrations Period. This period is further divided into two phases. The first phase, from 300 to 500 C.E., saw the movement of Germanic and other tribes and ended with the settlement of these peoples in the areas of the former Western Roman Empire, essentially causing its demise. The second phase, between 500 and 900 C.E., saw Slavic, Turkic and other tribes on the move, re-settling in Eastern Europe and gradually making it predominantly Slavic. Moreover, more Germanic tribes migrated within Europe during this period, including the Lombards (to Italy), and the Angles, Saxons, and Jutes (to the British Isles). The last phase of the migrations saw the coming of the Hungarians to the Pannonian plain. 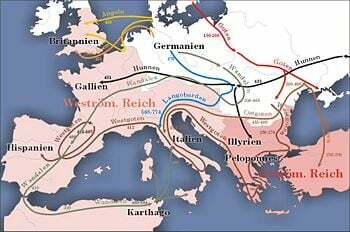 German historians of the nineteenth century referred to these Germanic migrations as the Völkerwanderung, the migrations of the peoples. The European migration period is connected with the simultaneous Turkic expansion which at first displaced other peoples towards the west, and by High Medieval times, the Seljuk Turks themselves reached the Mediterranean. The medieval period, although often presented as a time of limited human mobility and slow social change in the history of Europe, in fact saw widespread movement of peoples. The Vikings from Scandinavia raided all over Europe from the eighth century and settled in many places, including Normandy, the north of England, Scotland, and Ireland (most of whose urban centers were founded by the Vikings). The Normans later conquered the Saxon Kingdom of England, most of Ireland, southern Italy and Sicily—although the migration associated with these conquests was relatively limited—the Normans in most cases forming only a small ruling class. Iberia was invaded by Muslim Arabs, Berbers, and Moors in the eighth century, founding new Kingdoms such as al Andalus and bringing with them a wave of settlers from North Africa. In the other direction, European Christian armies conquered Palestine for a time during the Crusades in the eleventh to thirteenth centuries, founding three Christian kingdoms and settling them with Christian Knights and their families. This permanent migration was relatively small however and was one of the reasons why the Crusaders eventually lost their hold on the Holy Lands. In the fourteenth century, German military colonists settled the Baltic region, becoming a ruling elite. At the end of the Middle Ages, the Roma arrived in Europe (to Iberia and the Balkans) from the Middle East, originating from the Indus river. Internal European migration stepped up in the Early Modern Period. In this period, major migration within Europe included the recruiting by monarchs of landless laborers to settle depopulated or uncultivated regions and a series of forced migration caused by religious persecution. Notable examples of this phenomenon include mass migration of Protestants from the Spanish Netherlands to the Dutch Republic after the 1580s, the expelling of Jews and Moriscos from Spain in the 1590s, and the expulsion of the Huguenots from France in the 1680s. Since the fourteenth century, the Serbs started leaving the areas of their medieval Kingdom and Empire that was overrun by the Ottoman Turks and migrated to the north, to the lands of today's Vojvodina (northern Serbia), which was ruled by the Kingdom of Hungary at that time. The Habsburg monarchs of Austria encouraged them to settle on their frontier with the Turks and provide military service by granting them free land and religious toleration. The two greatest migrations took place in 1690 and 1737. Other instances of labor recruitments include the Plantations of Ireland - the settling of Ireland with Protestant English colonists in the period 1560-1690 and the recruitment of Germans by Catherine the Great of Russia to settle the Volga region in the eighteenth century. European Colonialism from the sixteenth to the early twentieth centuries led to an imposition of European colonies in many regions of the world, particularly in the Americas, South Asia, Sub-Saharan Africa, and Australia, where European languages remain either prevalent or in frequent use as administrative languages. Major human migration before the eighteenth century was largely state directed. For instance, Spanish emigration to the New World was limited to settlers from Castile who were intended to acts as soldiers or administrators. Mass immigration was not encouraged due to a labor shortage in Europe (of which Spain was the worst affected by a depopulation of its core territories in the seventeenth century). Europeans also tended to die of tropical diseases in the New World in this period and for this reason, England, France, and Spain preferred using slaves to free labor in their American possessions. This changed in the eighteenth century due to population increases in Europe. Spanish restrictions on emigration to Latin America were revoked and the English colonies in North America saw a major influx of settlers attracted by cheap or free land, economic opportunity, and religious toleration. By 1800, European emigration had transformed the demographic character of the American continent. Their influence elsewhere was less pronounced as in South Asia and Africa, European settlement in this period was limited to thin layer of administrators, traders, and soldiers. While the pace of migration had accelerated since the eighteenth century (including the involuntary slave trade), it would increase further in the nineteenth century. Manning distinguished three major types of migration: labor migration, refugee migrations, and lastly urbanization. Millions of agricultural workers left the countryside and moved to the cities causing unprecedented levels of urbanization. This phenomenon began in Britain in the late eighteenth century and spread around the world, continuing to this day in many areas. Industrialization encouraged migration wherever it appeared. The increasingly global economy globalized the labor market. The Atlantic slave trade diminished sharply after 1820, which gave rise to self-bound contract labor migration from Europe and Asia to plantations. Also overpopulation, open agricultural frontiers, and rising industrial centers attracted voluntary, encouraged and sometimes coerced migration. Moreover, migration was significantly eased by improved transportation techniques. Between 1846 and 1940, mass migrations occurred world wide. The size and speed of transnational migratory movements became unprecedented. Some 55 millions of migrants moved from Europe to America, and an additional 2.5 million moved from Asia to America. Of this transatlantic migrations, 65 percent went to the United States. Other major receiving countries were Argentina, Canada, Brazil, and Cuba. During this same period similar large numbers of people migrated over large distances within Asia. Southeastern Asia received 50 million migrants, mainly from India and south China. North Asia—Manchuria, Siberia, Central Asia, and Japan together—received another 50 million. Less is known about exact numbers of the migrations from and within Africa in this period, but Africa experienced a small net immigration between 1850 and 1950, from a variety of origins. Transnational labor migration reached a peak of three million migrants per year in the early twentieth century. Italy, Norway, Ireland, and the Quongdong region of China were regions with especially high emigration rates during these years. These large migration flows influenced the process of nation state formation in many ways. Immigration restrictions have been developed, as well as diaspora cultures and myths that reflect the importance of migration to the foundation of certain nations, like the American melting pot. The transnational labor migration fell to a lower level from the 1930s to the 1960s and then rebounded. The twentieth century also experienced an increase in migratory flows caused by war and politics, with large numbers of refugees feeling their homelands that had been taken over by factions hostile to their ethnicity or religion. Muslims moved from the Balkans to Turkey, while Christians moved the other way, during the collapse of the Ottoman Empire. 400,000 Jews moved to Palestine in the early twentieth century. The Russian Civil War caused some 3 million Russians, Poles, and Germans to migrate out of the Soviet Union. World War II and decolonization also caused migrations. The causes of migration can be seen as a series of push and pull factors—those factors which either forcefully push someone into migration or attract them. Push and pull factors are usually considered as north and south poles on a magnet. A pull factor is something concerning the country a person migrates to. It is generally a good thing that attracts people to a certain place. Changes in population distribution: Human migration has had a significant effect on world geography, contributing to the development of separate cultures, the diffusion of cultures, and the complex mix of cultures and multi-cultural populations found in many parts of of the world. Mixing of different cultures and races: This has often led to negative social behaviors–tensions in society between majorities and minorities, followed often by local struggles, racism and racial discrimination. Increases in criminality may also result. However, effects in different societies vary. There are also some positive cultural effects of migration, for example exchange of cultural experience and new knowledge. Demographic consequences: Since migration is selective of particular age groups, migrants are mostly young and productive. This can cause a demographic crisis—population aging, that in turn can be followed by economic problems (a shrinking economically active population has to finance an extending inactive population). Economic results, which are of the greatest importance for the development of countries. ↑ Edwin Bryant, The Quest for the Origins of Vedic Culture: The Indo-Aryan Migration Debate (Oxford University Press, 2001, ISBN 0195137779). ↑ Patrick Manning, Migration in World History (Routledge, 2005, ISBN 0415311470). ↑ Alferdteen Harrison, Black Exodus: The Great Migration from the American South (University Press of Mississippi, 1991, ISBN 087805491X). ↑ Julie A, Phillips, Crime and migration: Three essays examining causes and consequences of two urban social challenges January 1, 1998. Retrieved October 19, 2018. Gimbutas, Marija. Bronze Age cultures in Central and Eastern Europe. The Hague/London: Mouton, 1965. This page was last modified on 19 October 2018, at 19:14.